This year’s summit might be the last for the “16+1” initiative – not because it’s dying, but because it’s expanding. The old city of Dubrovnik in Croatia is gearing up to host the ninth summit of the heads of state and government of China and Central and Eastern Europe (CEE) on April 11-13. The summit is likely to be a momentous event for China-CEE relations. Many are asking whether this is not going to be the last summit for the fledgling initiative. The spotlight of the Belt and Road Initiative (BRI) is usually on the Asian (be they Central Asian, South Asian, or Southeast Asian) or African participants. Yet the post-communist countries of Central and Eastern Europe form an important part of the BRI. 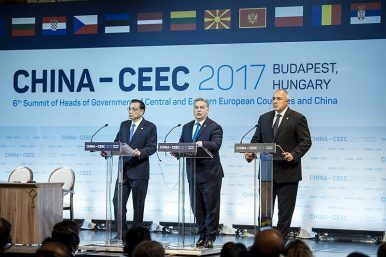 In fact, the CEE region was among the best represented regions at the 2017 Belt and Road Forum: of the 28 heads of state or government, four were from the region (representing the Czech Republic, Poland, Hungary, and Serbia), while Romania sent a delegation led by the country’s deputy prime minister. This reflects the very intense development of the China-CEE cooperation under the auspices of the BRI. This cooperation is better known as the “16+1,” referring to the 16 CEE states with which China (the “+1”) is developing ties: Albania, Bosnia and Herzegovina, Bulgaria, Croatia, the Czech Republic, Estonia, Hungary, Latvia, Lithuania, Macedonia, Montenegro, Poland, Romania, Serbia, Slovakia, and Slovenia. The 16+1 mechanism involves quite a heterogeneous group of countries. Of the 16 participating CEE states, 11 are EU member states (five of which are also members of the single currency eurozone), four are EU candidate countries, and one is a potential candidate state. To many observers, therefore, the multiple high-level summits, business meetings, and statements by representatives of the CEE countries and China seem to be framing a new regional context in the European continent. As a result, China’s cooperation with CEE countries has attracted a growing barrage of criticism from the European Union (EU). In the past three years, EU officials have lambasted China for allegedly undermining the European integration process by turning the CEE countries into “Trojan horses” and sowing division in the continent. Some have even demanded that China adopt a “One Europe” policy just as the EU supports the “One China” policy. This culminated in early March 2019, just as President Xi Jinping was embarking on his trip to Italy, in an official proclamation by the European Commission that for the first-time labelled China as a “systemic rival” of the EU. This is an unusual move for the EU both because it rarely resorts to such hostile language and because it has strategic threats much closer to home – such as Russia, Turkey, and the spread of populism across the continent. In this respect, many commentators have been asking how long China will persist with its support for the 16+1. Already in June 2018, at the eighth summit of the China-CEE cooperation in Sofia, Bulgaria, many were speculating that both Beijing and the CEE capitals would opt for a cooling down period and perhaps turn the summits into a biannual instead of an annual event. Yet the forthcoming meeting at Dubrovnik defies all such predictions. So what can we expect this year? First, the ninth summit of the China-CEE cooperation is indeed likely to be the last one for the 16+1. The reason, however, is not what one (especially the EU) might expect. Instead, Greece is almost certainly going to be invited to become part of the initiative. This will effectively turn the “16+1” into the “17+1.” Such a move seems to corroborate the claims that the significance of CEE countries for China is closely intertwined with the acquisition by COSCO of the controlling share of the Greek port of Piraeus. Some have even claimed that Beijing is at least partially responsible for the resolution of the name dispute between Greece and Macedonia as China is keen to connect the port of Piraeus via Macedonia to its proposed high-speed rail link between Belgrade and Budapest and then onwards to the western part of the continent. The emergence of the 17+1 will have direct bearing on China-CEE cooperation. Greece is significantly different from the other participants in this initiative. Being post-communist states is one feature that all 16 participating states seem to share. The addition of Greece will likely dilute some of the regional dimensions of the China-CEE cooperation and re-emphasize the bilateral nature of China’s relations with individual countries. This is a strategic move that would appeal both to Beijing and the CEE capitals, and is also intended to allay EU fears that China is trying to split the continent (although it is dubious how effective this would be). Perhaps most importantly, the development of a 17+1 initiative demonstrates that China has already become a fully-fledged European power. The growing number of Chinese investments and relationships in the continent suggests a much broader and more complex entanglement in European affairs than either Beijing or any European capital expected. Such a reality demands that China own its position as a European power (even if it is unintentional). At the same time, Europe needs to engage in a mature and meaningful debate on China that goes beyond the simplistic bifurcations between friend/enemy, rival/ally, etc. As the evolution of China-CEE cooperation indicates, we live in a complex world and interlocutors can perform multiple and contradictory roles all at the same time. Wishing away China is impossible and ignoring that it is a European power would be detrimental. Emilian Kavalski is the Li Dak Sum Chair Professor in China-Eurasia Relations and International Studies and the Director of the Global Institute for Silk Roads Studies at the University of Nottingham Ningbo, China (UNNC). What Has China Accomplished in Central and Eastern Europe? Each year, the 16+1 summit has Central and Eastern European states clamoring for Chinese money.